KINSHOFER Hammer Team. Thomas Friedrich, KINSHOFER president and CEO celebrates with Lifco and Hammer partners. 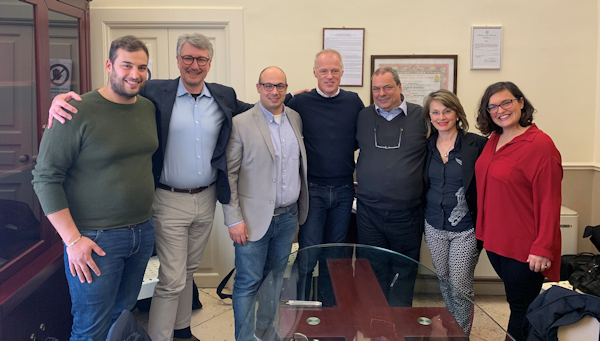 Pictured, from left: Onofrio Modugno, Hammer partner; Erik Gabrielson, Vinge – Lifco RA; Valerio Modugno, MD Hammer; Thomas Friedrich, KINSHOFER president and CEO; Giovanni Modugno, Hammer partner; Giovanni and Valerio’s sisters. KINSHOFER is one of the world’s leading sources of high-quality attachments for excavators and loader cranes. Founded in Germany in 1971, the KINSHOFER Group includes the, Demarec, RF Systems, Auger Torque, Doherty and Solesbee’s brands. KINSHOFER offers a wide product range with just about every type of attachment for equipment carriers with and without hydraulics in industries as diverse as scrap, demolition, railway, landscaping, construction, snow clearing, excavating, road building, forestry, tire recycling and biomass. For more information: Kinshofer USA, 6420 Inducon Drive, Suite G, Sanborn, NY 14132; 800-268-9525; [email protected]; www.kinshofer.com; Facebook; Twitter; YouTube or Instagram.